Hey, readers! It's time for a new edition of Cheesy Movies Tasha Likes. I saw The Forbidden Kingdom playing on IFC really late one night and decided it sounded like the PERFECT MOVIE. Totally not shocking: I was right! Jason is a Southie who gets picked on by bullies and loves martial art films. One day he finds a staff and is transported to Ancient China. He discovers his destiny is to return the staff to its owner, the Monkey King (see my review of The Monkey King here) so he can defeat an evil warlord and return power to the Emperor. 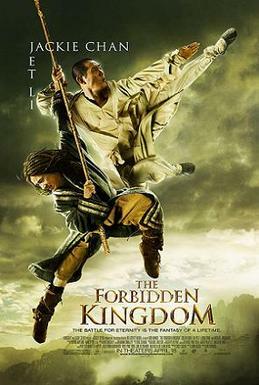 The Forbidden Kingdom has two actors whom I love in the same face space: Jet Li (LOVE him, love love love) and Jackie Chan (did you ever watch that cartoon with Jackie Chan? It was just me? Okay then). Basically, you don't need any other reason to watch this movie, but I'll give you some more anyway: IT IS HILARIOUS AND AWESOME. Michael Angarano rocks the mullet-with-pony-tail combo, shows his "powerful staff" to the token female character, Golden Sparrow, way too many times; there's a woman with purple hair; and Liu Yifei almost makes out with every guy in this movie except Jackie Chan, all while playing a musical instrument. This movie caters to American tastes, for sure. There's little talk of Buddhism, which is the original message of the story of The Monkey King, and there's an almost self-conscious cheesiness to it, especially the Boston scenes. If you even casually watch kung-fu movies like Kill Bill or Crouching Tiger Hidden Dragon, the sets and set-up to the story will feel very familiar to you, but in a good way that really lets you appreciate the story. The only thing that made me grimmace was when Jason decided to return to South Boston after having awesome adventures in Ancient China. WHY WOULD YOU DO THAT? But I suppose they had to end the movie somehow. If you like kung-fu movies, especially cheesy kung-fu movies (but really any sort of kung-fu movie), you should definitely check out The Forbidden Kingdom. It is super-accesible and fun.